How to watch Alice Through the Looking Glass (2016) on Netflix Germany! Sorry, Alice Through the Looking Glass is not available on German Netflix, but you can unlock it right now in Germany and start watching! With a few simple steps you can change your Netflix region to a country like India and start watching Indian Netflix, which includes Alice Through the Looking Glass. We'll keep checking Netflix Germany for Alice Through the Looking Glass, and this page will be updated with any changes. Alice Through the Looking Glass is not available in Germany BUT it can be unlocked and viewed! After years at sea, Alice returns. But she must go through the looking glass and back in time to save the Mad Hatter before the clock runs out. A magic mirror. A time-traveling Chronosphere. A Mad Hatter in serious danger. There’s more at stake than Alice’s head. There is a way to watch Alice Through the Looking Glass in Germany, even though it isn't currently available on Netflix locally. What you need is a system that lets you change your Netflix country. With a few simple steps you can be watching Alice Through the Looking Glass and thousands of other titles! 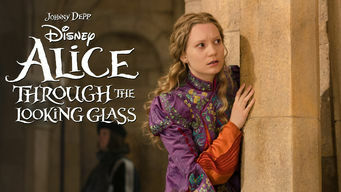 Watch "Alice Through the Looking Glass"